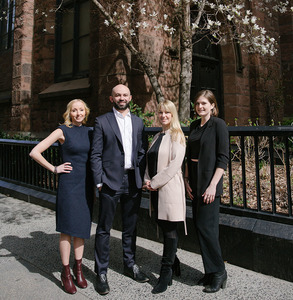 As The Joe + Kelly Team at Compass, Joe Quiros and Kelly Waters bring clients a fresh approach to the complex world of New York City real estate. With integrity as their cornerstone, Joe and Kelly focus on achieving success while adhering to the highest standards of honesty and transparency. "From the beginning, we've shared a deep commitment to doing business 'the right way,'" explains Joe. "We made a decision at the start of our partnership to put our energy into working with people who have good intentions and who choose to work in an ethical way." Drawn to work together by this shared business philosophy, their team success is further driven by their complementary skillsets. In addition to their expertise as top-performing professionals, Joe and Kelly's loyal client base also benefit from their personal experience as real estate investors. Whether buyers, sellers, renters or developers, Joe and Kelly fully understand the financial, emotional and logistical facets of every transaction. "We take holistic approach to the business, focusing on taking care of people through what can be a very emotional and stressful time. Having two of us available and focused on our clients' best interests means there's always someone ready to help, no matter what time of the night or day." Kelly is an extremely detail-oriented real estate professional with a flair for organizing day-to-day operations. She's a true expert at discerning client needs and deftly coaching clients through the necessary steps to meet those needs. Joe's effortless ability to look at the big picture makes him particularly skilled at marketing and business development. He excels at ferreting out new opportunities while ensuring business is always being represented in the right way. Never ones to look at any transaction as a one-off opportunity, The Joe + Kelly Team hope to build client relationships that last a lifetime.